At first glance, The 100 is a very inclusive series, at least racially. The 100 currently has or has had: Monty, Chancellor Thelonious Jaha, Raven Reyes, Lincoln, Jackson, Nathan Miller, Indra, Sinclair, Dr. Tsing, Wells Jaha, Anya, Commander Shumway, John Mbege, Connor, Rivo and Callie 'Cece' Cartwig. That is an impressive list and it would be easy to sit back and accept The 100 as being a racially progressive show, particularly in a world in which it is still acceptable to set a show in New York City and have an all White cast (yes, I’m looking at you Girls) Let’s face it, Shonda Rhimes is making waves in television with her routinely diverse casts, tossing out the challenge to others to follow suit. If, and only if, you don’t look closely at the characterisation of The 100, it would seem that the CW dystopian futuristic fantasy is meeting the challenge. The first thing to note is that though the characters of colour are plentiful, anyone would be hard pressed to say that most of them represent leading characters (we would also challenge anyone to actually remember all of the characters listed above). In fact, when they don’t fall into the sidekick role, these characters spend limited time on screen and/or disappear entirely from The 100 cast. Even the short lived characters or minor characters fall into heavily trope laden roles. For example, Monty is the resident East-Asian computer geek and plays sidekick to Jasper. Dr. Tsing exists solely to take orders from Cage, even though she believes in the medical experiments on the Grounders and the Sky People, it’s clear who is really leading the charge. Wells died simply to add angst to Clarke’s backstory, though that was clearly already established with the often used writer’s device of the death of a parent. Commander Shumway appeared long enough to be the fall guy for Kane but I suppose every wrongly rehabilitated character needs a POC to take the blame for their bad actions. Raven is clearly a highly valued character. We have seen The 100 turn to her repeatedly to deal with technical issues. Despite all of the good that Raven has done for the Sky People, she is clearly secondary to Clarke and certainly far less desirable. On the Arc, Raven and Finn were in a romantic relationship and it was clear that they were important to each other. When Finn was sent to earth, Raven risked her life to join him. This should have been a joyous reunion but it was complicated by the fact that after being on earth a N.Y. minute, Finn was diving into Clarke’s pants. The 100 placed Raven and the ever so blonde Clarke in competition for Finn’s affections. Clearly, Raven could not win. How could she, when Clarke was perceived as a precious princess (a name which Finn called her affectionately)? It would have been nice if Finn had even hesitated in his choice, though! Yes, there is certainly a class issue at play because Clark's parents were in a position of power on the Arc, while Raven’s parents were not but that again highlights the racial disparity between the two women, because it was clear from the members of the council, that the numbers of POC in positions of power was relatively small compared to the White characters. We keep hearing about all of Raven’s skill but it is very clear that she will not be groomed as part of the leadership for the next generation. Raven will be in a supporting role while the White characters around her make the decisions. The representation of Women of Colour did not improve with the introduction of Indra. Though Indra is clearly respected by the Grounders, she is Lexa’s second. Where Lexa is willing to break with tradition, Indra is a hard liner who most frequent emotion is rage. Indra is essentially the walking avatar of the Angry Black woman - so much so that a smile is probably a foreign facial expression now (she and Michonne can practice their happy faces together). Indra yells at everyone she interacts with and stalks across the screen. We know absolutely nothing about her. It is worth noting that while we are told that she is a respected leader and fighter, it was the untrained Octavia who saved her life. Anya was certainly a less trope laden WOC battle leader - actually being willing (albeit grudgingly) to listen; a powerful fighter, an inspiring leader with considerable cunning. And she’s dead. Oh Anya, just as we were beginning to know you and want to know more. Lincoln is another prominent POC who seems to be strong and ever-present, but his characterisation is far from flawless. Almost from the first moment we saw him, Lincoln became almost bizarrely enamoured of Octavia - even forsaking and betraying his people for the sake of the love of a distant White woman which was odd to say the least (even if more interracial couples on television are sorely needed. 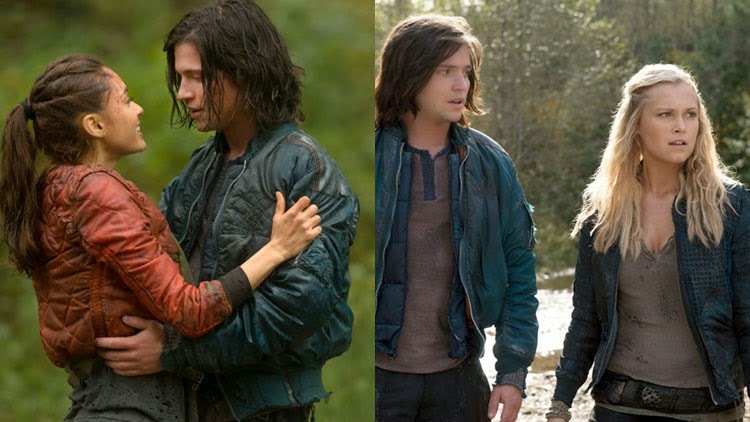 And this is the CW - bizarre love interests are the norm; I’m still not sure what Clarke and Raven saw in Finn). We did have a belated justification though - so we could certainly let that go. But then there’s the whole reaper storyline; here we have a Black man becoming addicted to drugs that turned him into an animalistic raging cannibal. Yes he didn’t choose it, yes it was forced on him (though the Black man being experimented on isn’t much of an improvement - especially since medical experimentation on Black men has a deeply horrifying history that should not be invoked lightly or ignored in such a scene) and yes there were story reasons - but we still have a Black man being turned into a drug addicted animalistic, raging cannibal. On a more complicated note is Bellamy who is often hailed as POC and one of the main characters and a principle love interest of Clarke (and after the most recent episode of dangling upside down in package-emphasising underwear, it’s clear the show is going to run with this). He is largely free from POC tropes and is generally a great, complex and nuanced character with real history. We like him and he’s certainly the most prominent of the POC on the show. But it’s not that simple. The actor, Bob Morley, is most certainly a POC - his mother is Filipina. There can be no doubt about that and we certainly don’t doubt Bob Morley as a Men of Colour. But is he playing a MOC? This is one of those times when we ask ourselves whether we are actually portraying diversity - or whether the watcher has to go google behind the scenes to find it. Bellamy is not instantly apparent as a POC - and there has been no particular effort to characterise him as such, which is already difficult with the prevalence of the White default so many viewers have. More than that, if anything there have been more attempts to characterise Bellamy as White; while Bob Morley is certainly a POC, Spencer Drever (who played Bellamy as a child in the flashbacks) is not. Nor, as far as we can see, are Monique Ganderton (who played Bellamy and Octavia’s mother, Aurora) or Marie Avgeropoulos (who plays Octavia, Bellamy’s sister) or Olivia Steele-Falconer (who plays Octavia as a child in the flashbacks). We see Bellamy as a POC because we know Bob Morley is a POC (and, again, there is no doubt about Bob Morley’s race) but without that external knowledge it is much harder to make that assumption - especially with an entirely white biological family (and, apparently, childhood). The problem comes when we see so many tropes put together - yes, often with “story” reasons, but the raging Indra, cast aside Raven, animalistic, addicted Lincoln, sinister Shumway, sacrificed Wells… when you start stacking them up they become very hard to ignore and beg for more subversion, characterisation and prominence.